Made from very high quality, supple black cowhide. Side zip fastening with Velcro flap. Carbon Kevlar protection on shin and outside ankle area. 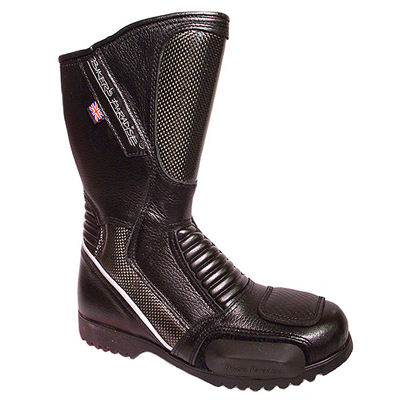 A FAB bargain boot - ideal for scooter riders and motorcycle riders. PLEASE NOTE: This item cannot be exchanged like for like as it is the last one. As this item is being sold as clearance, if a refund is required, a 10% re-stock will be charged. However, should you wish to exchange this item for a running line, the new item will be sent out with FREE P&P.